Pueraria lobata (flowers).Forest and Kim Starr.Starr Environmental.Center for Invasive Species and Ecosystem Health.invasive.org. (Accessed 7/2014). Pueraria lobata is a perennial, stout, herbaceous to woody vine pith white; root system large, fleshy, tuberous, expanding; stems can grow to 10-30 m long in a season, herbaceous stems dying back in fall, colonial from root sprouts, young parts densely tan-hairy; bark brown on larger woody stems, densely covered with corky lenticels; stipules egg-shaped. Leaves alternate, 3-parted, leaflets broadly egg-shaped, 10-15 cm, often 2-3 lobed, hairy below, stalk of terminal leaflet to 2 cm. Flowers red-purple, fragrant, pea-flower-shaped, 2 cm long; inflorescence of dense, axillary unbranched clusters to 20 cm long. Fruit dry, hollow, hairy pod, 4-5 cm long, thin-walled, flattened; seeds 3-4, to 0.4 cm reddish with dark pattern. Habitat: Covering ground and climbing other vegetation. Notes: This infamously noxious plant is starting to become a serious problem this far north and is spreading. Introduced for erosion control in southern USA. Can be controlled by repeated mowing or cutting (Uva et al. 1997). Roots apparently killed by extended below freezing weather. Becomes a perennial, woody vine in sheltered sites. Seed viability here unknown. To be tested. 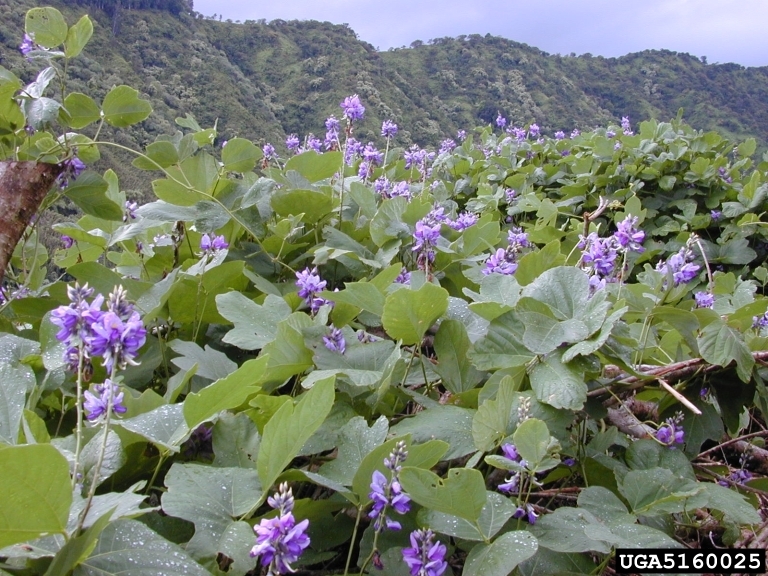 Pueraria lobata. Johnny Randall.North Carolina Botanical Garden. 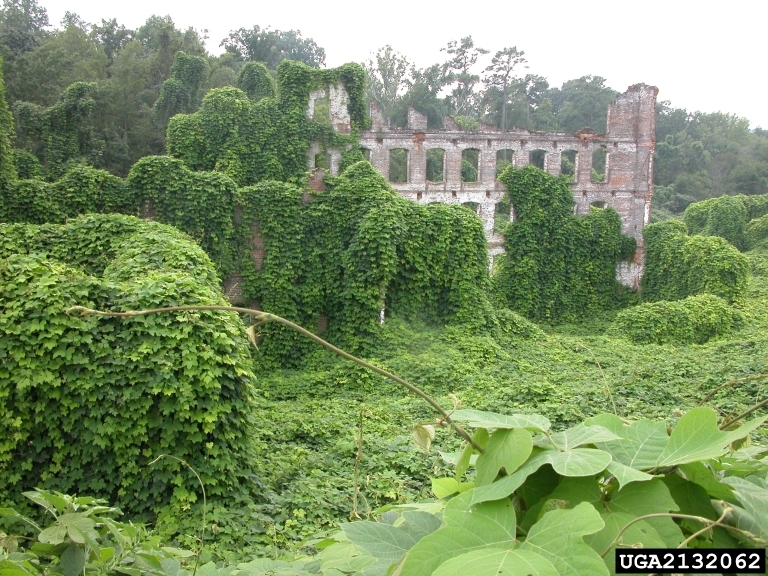 Environmental.Center for Invasive Species and Ecosystem Health..invasive.org.